When we come across webs with small-sized contents, we may need to modify the browser's zoom level. The drawback is that it will return to its previous level when we relaunch it. However, with Default FullZoom Level we can modify its default settings. 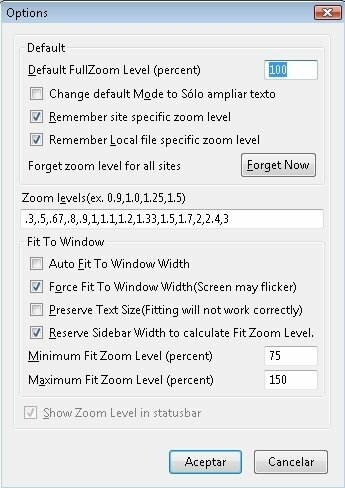 Default FullZoom Level is a Firefox add-on that allows us to configure and preset the zoom level of the browser however we want. By means of its options we can adjust it and establish the zoom we want for certain pages, as it can memorize websites. It also allows us to adapt the window's width, so that our view of the webs visited isn't altered, being able to carry out all these actions from the access provided in the browser's bottom right corner. Adjust your browser's zoom level. Possibility to establish the zoom for specific webpages. 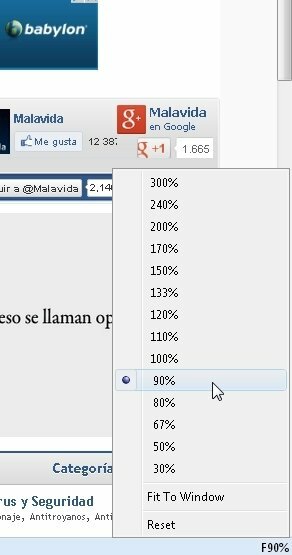 Shortcut to its functions from Firefox's lower toolbar. Adapt your browser's zoom to your browsing needs with the Firefox add-on Default FullZoom Level.